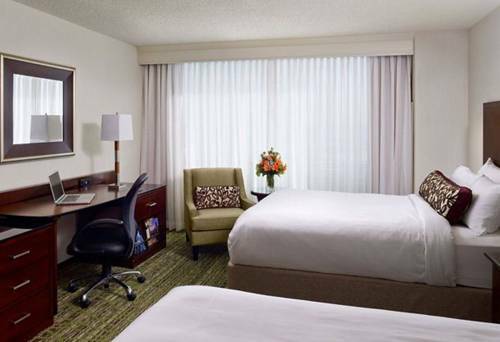 From location to accommodation, all of the elements come together perfectly at Philadelphia Airport Marriott. Connected via a convenient walkway to Terminal B at Philadelphia International Airport (PHL), our hotel offers guests the perfect retreat after a long day of travel. Settle into our elevated guest rooms and suites, all of which boast soundproof windows, and enjoy features like deluxe bath amenities, flat-screen TVs and high-speed Wi-Fi. Stretch tired muscles in our upscale gym or refuel with a delicious meal at Aviation Grill, our signature restaurant. Conveniently located near Lincoln Financial Field, the home stadium of the Philadelphia Eagles, our hotel is a great choice for fans visiting the city; we're also just a short trip away from downtown's many sights and attractions. If you're hosting an event in Philadelphia, look no further than our 12,600 square feet of contemporary event space, which includes an expansive ballroom. We look forward to welcoming you to Philadelphia Airport Marriott. Aviation Grill: Fuel up before heading to Philadelphia Airport at Aviation Grill. Open for all-day dining, our restaurant and bar offers something for everyone, including delicious breakfasts, healthy lunches and savory dinners.